Lafayette Drug & Alcohol Resistance Team wins a $250 Mini Grant! The Lafayette Drug & Alcohol Resistance Team won a $250 Mini Grant at YADAPP (Youth Against Drugs & Alcohol Prevention Program) this summer. 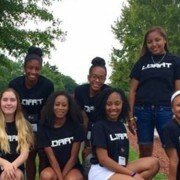 This is an annual summer leadership conference that takes place on the Campus of Longwood University. It focuses on empowering teens to keep their schools and communities alcohol and drug free by taking positive peer leadership roles. Mr. Jefferson has been taking students to this Leadership conference for the past 3 years. https://wjccschools.org/lhs/wp-content/uploads/sites/20/2015/08/YADAPP1.jpg 375 665 Amy Wallisch https://wjccschools.org/lhs/wp-content/uploads/sites/20/2017/10/Lafayette-High-School.png Amy Wallisch2015-08-28 13:25:342015-08-28 13:35:42Lafayette Drug & Alcohol Resistance Team wins a $250 Mini Grant!